Insects in the family Calliphoridae are generally referred to as blow flies or bottle flies. Blow flies can be found in almost every terrestrial habitat and are found in association with humans throughout the world. In 1980 the immigrant species Chrysomya rufifacies was first recovered in the continental United States. This species is expected to increase its range in the United States. Figure 1. Adult hairy maggot blow fly, Chrysomya rufifacies (Macquart). Photograph by James Castner, University of Florida. This species is now established in southern California, Arizona, Texas, Louisiana, and Florida. It is also found throughout Central America, Japan, India, and the remainder of the Old World. 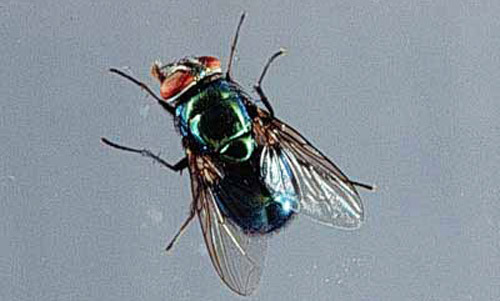 Adults are robust flies, metallic green in color with a distinct blue hue when viewed under bright sunlit conditions. The posterior margins of the abdominal tergites are a brilliant blue. The larvae are known as hairy maggots. They received this name because each body segment possesses a median row of fleshy tubercles that give the fly a slightly hairy appearance, although it does not possess any true hairs. The puparium is the hardened and shrunken outer skin of the mature maggot. The pupa develops entirely within this hardened shell which looks similar to a rat dropping or a cockroach egg case. The fly life cycle includes four life stages: egg, larva, pupa, and adult. The eggs are approximately 1 mm long and are laid in a loose mass of 50 to 200 eggs. Group oviposition by several females results in masses of thousands of eggs that may completely cover a decomposing carcass. The eggs hatch in as little as eight hours (depending on air temperature) and the larvae feed on carrion until they reach maturity. Upon maturity, they migrate away from the carrion to search of a pupation site. Pupation usually occurs within the first inch of topsoil or under leaf litter, rocks, or fallen limbs. During this time, the larval skin shrinks and hardens to form the puparium, which is dark brown. This stage may last for 7-12 days, depending on temperature. The adults can live up to six weeks. Although the true economic impact of the immigration of this species into the United States is not yet known, it is reported as a secondary myiasis producer in Hawaii, Mexico, and Central America. The economic damage generally associated with the presence of this fly species is the cutaneous myiasis commonly inflicted on livestock. In Australia it is known to strike sheep but it is a secondary invader and acts as a scavenger on necrotic tissue and as a predator on other maggots. This species may be considered beneficial since it has been used in the treatment of osteomyelitis and because it is considered a predatory maggot. It voraciously consumes the larvae of other species, and even resorts to cannibalism when food resources are depleted. This species is of particular importance in the southeastern, central, and southwestern portion of the United States as the adults are among the first insects to arrive at a fresh carcass in these areas. The adults usually arrive within the first 10 minutes after death as long as atmospheric conditions are favorable for activity. The larvae have a shorter development time than other species and their predaceous nature can alter entomologically-based postmortem interval estimations, which are founded on the prey species. This species must have access to decomposing carrion or rotten meat in order to complete its life cycle. Therefore, removal of garbage and carcasses will disrupt the life cycle. Removal of vegetative refuse will reduce the annoyance caused by resident adult populations and the risk of recontamination. Baumgartner DL. 1986. The hairy maggot blow fly Chrysomya rufifacies (Macquart) confirmed in Arizona. Journal of Entomological Science 21: 130-132. Byrd JH. 1995. The effects of temperature on flies of forensic importance. M.S. thesis. University of Florida. 197p. Byrd JH, Butler JF. 1996. Effects of temperature on Chrysomya rufifacies (Diptera: Calliphoridae) development. Journal of Medical Entomology 34: 353-358. Castner JL, Byrd JH, Butler JF. 1996. Forensic insect field identification cards. Forensic Sciences Foundation, American Academy of Forensic Sciences. Colorado Springs, CO.
Hall DG. 1948. The blow flies of North America, Thomas Say Foundation Publication vol. 4. Entomological Society of America, Lanham, MD. Publishers. James MT. 1947. The flies that cause myiasis in man. U.S. Department of Agriculture Miscellaneous Publication 631. Smith KGV. 1986. A manual of forensic entomology. Cornell University Press. Ithaca, NY. 205p. Subramanian H, Mohan KR. 1980. Biology of the blow flies Chrysomyia megacephala, Chrysomyia rufifacies, and Lucilia cuprina. Kerala Journal of Veterinary Science 11: 252-261. Publication Date: January 1998. Latest Revision: August 2014. Reviewed: December 2017.